This article first appeared in Enterprise, The Edge Malaysia Weekly, on August 14, 2017 - August 20, 2017. CIMB Bank has launched Biz123, a platform that offers a complete range of solutions for small and medium enterprises (SMEs), from working capital and financing for a commercial or residential property to cash management and operational solutions. The platform aims to provide one-stop support that will help businesses grow and prosper. 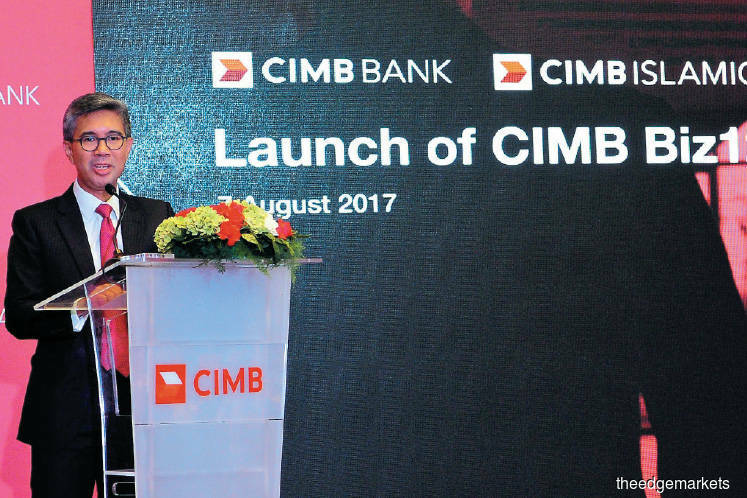 “We understand the challenges that businesses face, from making the best use of capital and abiding by regulations to managing a workforce and delivering the best customer experience,” says CIMB Group Holdings Bhd group CEO Tengku Datuk Seri Zafrul Aziz (picture). According to Yong Jiunn Run, CEO of group commercial banking at CIMB Group, the platform provides tools that are fast and easy to use, including convenient online account opening, instant account number upon completion of application and e-alerts on account activities via BizAlert. “Entrepreneurs want things done fast and easy. They don’t have the time to come to the branch to submit application forms and wait for approval. Therefore, Biz123 enables simpler documentation, shorter turnaround time and faster loan disbursement upon receiving complete documentation (for selected industry segments),” says Yong. He adds that the platform offers a wide range of products, including accounts and deposits, financing for the purchase of commercial, industrial and residential properties and business-focused packages. “Through Biz123, entrepreneurs can easily access accounts and deposits and financing options that CIMB offers, such as Online Business Current Account, Foreign Currency Current Account, Enterprise Clean Loan, Enterprise Portfolio Guarantee-I, Business Premises Loan and Business Premises Financing-i,” says Yong. He adds that the platform’s one-stop support includes a dedicated business call centre, a new website design to cater for business owners and a dedicated team of relationship managers for businesses. Entrepreneurs can log on to www.biz123.cimb.com to find out more about the new platform.